Hi all, I am looking for any JE Danaher Distillery bottles that may be for sale. I would like to add it to a family history display. Hi, I found a bottle identical to one on your bottle room page. It is the Amber "Reed and Carnrick Pharmacists New York" bottle. I was wondering if you might know the age and value of this bottle. If so please let me know! Thank you! hi i have a green glass bottle with wood and watson durham on it and it also has 3 letters on the bottom could you please tell me more about it if you can thank ? Hi, I was searching for information relating to my ancestors factory and your post came up. I would be really love to have a bottle from our factory as we dont have any and wondered if you still have it as I know the post was a little while ago. The factory was for initially mineral water and then lemonade etc as the customer needs changed. Your website is fabulous ~ I could easily spend the entire day here learning and enjoying! Thank you, Rick, for all the work you put into it! I found a tall (11-1/2")amber beer . Has a fancy slug plate but with no embossing . The base is lightly embossed Wm. Frank & Sons .Pitts. I'm trying to find out some facts on this one . Plain ? Rare ? & value ? Oh, I found one on E/bay but it is not embossed . Thanks Rick. I'm a Indiana bottle digger. 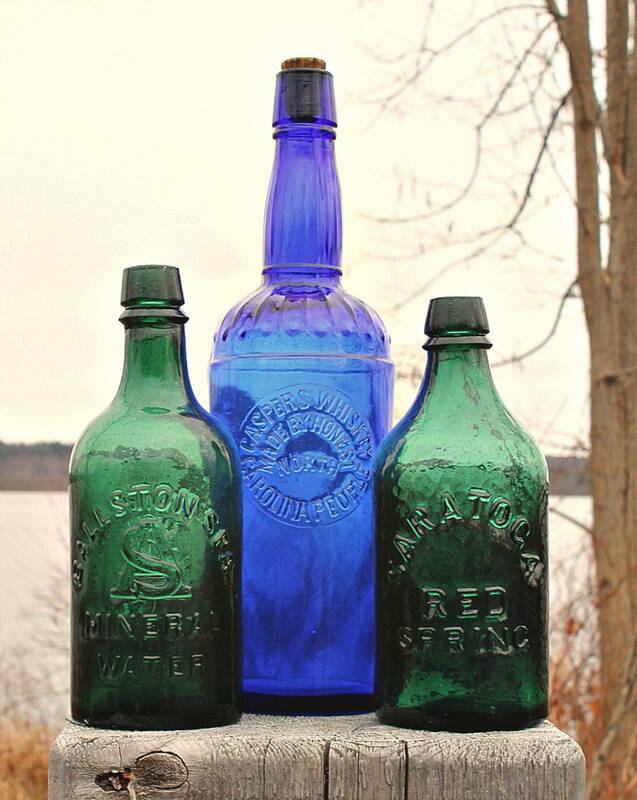 I have a green, LQC WishHart's Pine Tree Tar Cordial, Philadelpia, Patent 1859 bottle. It stands about 9.5 inches tall and has a small chip on the lip. Did you find most of the bottles on your site? I have a greenish mineral water bottle form Hennesy and Nolan Albany NY does it have a value? Hi. John C. Hecht was my 2nd great grandfather His wife was Sophia. They were in the soda water/mineral water business in Brooklyn, NY. From what I understand through research and what little is still known in the family, he, his wife, and his son John C had the business at was then #10 Yates, Brooklyn, NY. I would be interested in purchasing the bottle as I have been looking for any and all for quite some time. Please contact me. I have 3 whiskey bottles, 2 I trager quart amber bottles, and 1 Four Roses amber quart whiskey bottle. I saw you have the I trager in your collection. Can you give me an idea what they are worth? I have a clear glass bottle that is similar to a wine bottle. It has a old fashioned lady(victorian?) kinda frosted on the front and it says ICE WATER. It has a wire running around the neck of the bottle and going thru a ceramic top with wood actually touching the bottle to stop it up. It has no other markings on it as far as size or anything...any ideas if its old or has any value? Am seeking bottles from Wood & Watson (Durham) or Wood & Sons Bedlington. Was there in 96 and met Harry Wood (Durham). Interested in any bottles you can find... Will be in the UK from the 24th to 27th of September but will also purchase bottles that you can ship to me here in Canada. Thanks for any information you have. Great site, a credit to the hobby. I've just emailed you with some photos of an interesting blue glass bottle that I found at a small flea market in Amsterdam recently. I was wondering whether you could take a look and let me know if you think it's worth anything/perhaps tell me a bit more about it? I've listed it on Ebay but now I'm having second thoughts! fisrt Line "...jones & Co"
third line: "hanover and blackstone STS"
fourth line "boston , Mass"
the bottle is light purple and has a rectangular base and says "1902" on the bottom. Hi Jim, Lomax bottles are a good find and i assume they are the cobalt squat blob variant. I f you send me some pictures i will give you a good idea as to what you have. Ricksbottleroom@gmail.com thanks Jim. I have a several bottles with J.A. Lomax on them. I also have two clay bottles with JAL stamped on the side. I found them while building a building in downtown chicago. Where can I find more information about the bottles? I also have many more bottles with various markings and trademarks. Can you tell me any info on a glass bottle with J Hecht on one side with a J on the other side brooklyn ny 1861. ive been searching for info and cant seem to find any. Any info would be appreciatted. Thank you. I have a white retangular, twist top jar. On the bottom it says C overlapping L and 7. Anyone know anything about it???? Please help me!!! I'm looking for information about a flask I have. I believe it to be a pictorial flask (picture under glass) of an unknown politician. It has a screw cap (silver) and was found in a trunk in a barn with some other relics on property I bought back in the 80's. The property has a LOT of history so any information you can provide will be greatly appreciated. It appears to be dated to the early part of the 19th century. Is the house that is being rebuilt in Auburn? I collect Auburn NY bottles. If your interested in selling the Holmes bottle or come across any others, please let me know. I have a bottle that I found in my sisters mud basement as they were rebuilding a house. She lives in Auburn. The bolle is clear blueish a round top and has James.H.Holmes Auburn N.Y. on it, I was wondering if it is valuable? Hi Emma,always great to hear from people who can help with information and being a family member....well,doesn't get any better. I apprciate the corrections and will adjust the post accordingly. Thank you again. I am Councillor William Henry Wood's great granddaughter. I am emailing to correct you on the information supplied in this post.. He was born in or near Bedlington in Northumberland, and moved to Durham in 1890 with his wife Annie. In 1891 he started Wood & Watson Ltd, mineral water manufacturers in Gilesgate, Durham. He was twice mayor of the city in 1909/10 and 1919/20 (as pictured). The W.H. Wood Memorial Cup was given by his family to Durham City in 2008 and is displayed in the Town Hall together with an acknowledgement of his civic services. Further artefacts and memorabilia of Wood & Watson Ltd may be seen in Durham Heritage Centre. The architect you write about in the post, William Herbert Wood is no relation so far as we are aware, and certainly has no connection to the bottles displayed. W.H. Wood embossed bottles were often found in recent years by trespassers digging on a bankside adjoining Wood & Watsons factory (now housing)!